She’s big. Then small. Now she’s famous! Laugh larger with this third hysterical story about the girl who can shrink to pocket size. Milkshake is on the menu! Violet has fallen in love with the awesome shakes at Udderly Perfect, the coolest cafe around. But then the cafe is threatened with closure, all because of a mistake Violet made. She must find a way to keep it open. Perhaps she can persuade her favourite celebrity stuntwoman, Stella Lightfoot, to join the campaign. 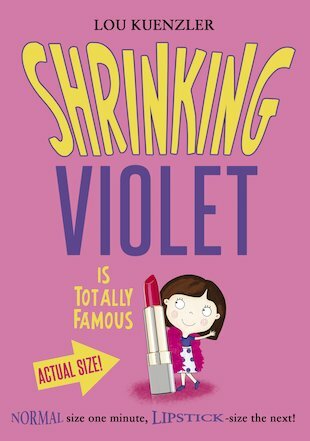 But when Violet shrinks and ends up in Stella’s luggage, she learns that her idol is not who she thinks she is. Now Violet might be the only one who can save Stella’s reputation. Can she save Udderly Perfect too? Nice book, an enjoyable read.